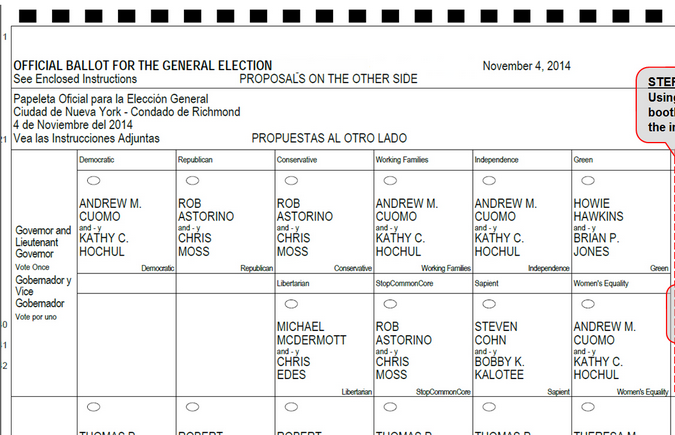 This looks like the ballot I just used an hour ago to vote for all the Green Party candidates. It is a bit confusing when you look at it since the other “third parties” are basically offering you a chance to vote for the Democrats (Working Family and Independence parties) or the Republicans (Conservative). This really gets into the whole question of political independence in the USA and what constitutes a third party, especially for radicals like us. For the longest time I have been arguing for a third party to the left of the Democrats even when the candidate is not particularly radical. For example, I regard Bob La Follette’s presidential campaign as a Progressive Party candidate in 1924 as an important challenge to the two-party system even though La Follette was a life-long Republican. Same thing with Henry Wallace who also ran under the Progressive Party banner in 1948 even though he was a New Deal Democrat. In fact Wallace’s campaign was mostly about trying to salvage New Deal values as Truman was pushing the party to the right. As an analogy, if Bernie Sanders—a Democrat for all practical purposes despite his “socialist” pretensions—decided to run as an independent in 2015, I would urge a vote for him. So tight is the grip of the two party system on the American body politic that any breach could ultimately serve as a hole in the dike that the Dutch boy tried to plug. Our purpose as radicals is to make the hole even bigger. A third party headed up by the likes of Bernie Sanders would not lead to socialism but it would certainly create a space for the left to get a wider hearing just as is the case with a formation like Syriza in Greece. So where does the Working Families Party fit into all this? It is best to think of them in terms of the American Labor Party that was founded in 1936 in order to make a vote for FDR palatable to leftist workers who were instinctively suspicious of the Democratic Party. Socialist Party bureaucrats in the trade unions, especially the needle trades, founded it. Despite the animosity of the CP toward the SP, they saw the value of the ALP so much so that by the 1950s it was regarded as a CP front. Vito Marcantonio, who was widely regarded as a CP fellow traveler, was elected as a Congressman from East Harlem on the ALP ticket, for example. If the ALP had simply served the needs of the CP along these lines, it would have served a useful purpose but like the WFP that followed in its footsteps, it was mainly a vehicle for corralling votes for the DP. Charles Post’s article in Against the Current magazine titled “The Popular Front: Rethinking CPUSA History” references one by Kenneth Waltzer in the Spring 1980 Radical History Review that is unfortunately behind a paywall. Titled “The Party and the Polling Place: American Communism and an American Labor Party in the 1930s”, it is a good introduction to the dodgy electoral politics of a nominally communist group trying to shore up the Democrats. Socialists criticized the ALP for failing to become an independent , federated, democratic labor party; they did not oppose La Guardia in 1937, but ran Norman Thomas for governor and held apart from membership until late 1938. Social Democrats, who enrolled in 1936, carped continually about the slow progress toward a labor party and the absence of internal party democracy. The Communists, however, made an objective of unity itself and composed a cheering section within the ALP. They neither pressed for special political results nor demanded progress toward in- dependence. ‘The building of the American Labor Party is a central task,’’ Israel Amter, the New York State Party chairman, instructed in late 1936. Party members and sympathizers enrolled in large numbers in the ALP clubs (or joined with the affiliated unions) and moderated their advocacy of independent politics and socialism. The Communists enthusiastically supported La Guardia, whom they had opposed four years earlier; they backed Lehman and much of the Democratic slate in 1938. They gave uncritical allegiance to the slate of state officers selected by ALP leaders in the first ALP primary in 1938, and they criticized Socialists and Social Democrats who complained about ALP deals with the major parties. Since the CP no longer has the muscle it once had, it was largely up to other people to get the WFP off the ground if it was to serve the purpose of providing a left flank for the DP. The origins of the WFP can be traced to the New Party, another nominally “third party” created in the ALP template. Sometimes referred to as a “fusion” party, such formations are intended to provide a second, third or more spot on the ballot for the Republicans or Democrats. Daniel Cantor, a staffer on Jesse Jackson’s 1988 presidential campaign, and Joel Rogers, a U. of Wisconsin law professor and a Nation Magazine editor, launched the party in 1992. Like many on the left, I had hoped that Jackson might form a Rainbow Party but he was too wedded to DP careerism to take such a risk. I suspect that Cantor was relieved when Jackson decided to stay within the fold. As far as Rogers is concerned, you know what Shakespeare said about killing all the Nation Magazine editors, right? The base for the New Party was largely made up of ACORN chapters, the anti-poverty group that ran into trouble a while back after getting punked by ultrarightist James O’Keeffe. Despite collaboration with the Greens in the 1990s, the New Party’s main ambition was to get progressive Democrats elected, at least those with such a reputation. The party endorsed Barack Obama in his campaign for Senator from Illinois in 1996, for example. After the New Party ran out of gas, Cantor and Rogers decided to try a fusion-oriented party once again, this time as the Working Families Party. Surprising as it may seem, Rogers has made sure to keep a conversation going with Marxists despite his obvious class collaborationist orientation. In the March-April 1995 New Left Review, he has a piece titled “How Divided Progressives Might Unite”, a title that might betray his true agenda in light of what Alexander Cockburn wrote about “pwogwessives”. The New Party is/does all these things. On the last, most vexing, issue, its general solution is only to run its own candidates for office on its ballot line where they have a serious chance of winning. Where they don’t, it generally does nothing, or informally endorses the better of the major candidates, or, where the law permits, formally endorses the major party candidate (the candidate willing, of course) on its own ballot line. At this early stage in the party’s development, thus taking the wasted-vote problem seriously drives our independent efforts down to the local level. We are not running people for President or senator—at least not yet!—but for city councils, county boards, water commissioner, school boards, the occasional state assembly seat. Only after having established ourselves at this local level will we try to move up the electoral greasy pole. In other words, voting for a Democrat is a tactical question. Despite the appearance of this article in a hoary Marxist journal (that’s hoary as in old, not as in lifting up one’s skirts for a dollar), it breaks with the most fundamental question facing Marxists—the need for class independence. Even where there is no prospect of achieving their election the workers must put up their own candidates to preserve their independence, to gauge their own strength and to bring their revolutionary position and party standpoint to public attention. They must not be led astray by the empty phrases of the democrats, who will maintain that the workers’ candidates will split the democratic party and offer the forces of reaction the chance of victory. All such talk means, in the final analysis, that the proletariat is to be swindled. The progress which the proletarian party will make by operating independently in this way is infinitely more important than the disadvantages resulting from the presence of a few reactionaries in the representative body. if the forces of democracy take decisive, terroristic action against the reaction from the very beginning, the reactionary influence in the election will already have been destroyed. The New York “franchise” – that’s what they called it – for the New Party was held by James Steele of the CPUSA. So the parallels with the ALP are deep. I understand the concept, you are precise in describing it as an “analogy”, but Tim Lincecum will start throwing 94mph fastballs again and winning more Cy Young awards before this happens. But the really critical question is why people inside the system like Sanders are not willing to challenge it anymore. Leaving aside leftist critiques of their politics, Eugene McCarthy and George McGovern were willing to do it. Both did it inside the Democratic Party, of course, but at a time where such challenges meant something, with both openly confronting their own President over the Vietnam War. Jackson’s 1984 campaign was important, too, even if it was within the party primary system, and it could have, as you noted, resulted in the creation of a third party force in US politics. Where is an issue that might create a fissure that would encourage someone to buck the establishment? Oddly enough, it might be immigration. There has been an ongoing campaign of civil disobedience in response to record deportations and detentions. I get e-mails every week from Not1More about an action taking place somewhere. Yesterday, Illinois congressperson Luis Gutierrez warned the Democratic Party of an impending “civil war” if the President does not stop record numbers of deportations, stating that Latinos may start abandoning the party if nothing is done. You don’t need a history lesson (even a good and true one, such as Louis’s.) to know what a smoke-and-mirrors act is the WFP. They endorsed neoliberal Cuomo. Worse, its leaders threatened to bolt and start a new franchise if the endorsement was shot down and the unions–chiefly but not solely 1199 and the Mason Tenders– swore they’d leave and take their money with them if Cuomo did not get the nod. And of course Cuomo broke every promise he made to them, including his own laggard role in pushing for a Democratic senate or hiking the miserable minimum wage. . And of course we all knew it. Why? Because it was Cuomo, just as it would have been sleazy nominee Peter Vallone in 1998 had he ascended. Back then I could excuse it; WFP was the new kid on the block and needed a piggy back and some juice, but 16 years later and its not a party; it’s a doppelganger..
On fusion:, the WFP doesn’t even practice fusion. It practices identity theft. The only candidate to ever run solely on the WFP line in NYC (and likely New York State) was Liticia James, the present city Public Advocate. That was 11 years back, and she in effect had her Dem. primary for City Council stolen. We can argue (we have argued) about whether supporting any Democrat crosses the class line, but the WFP endorses virtually every Democrat when it endorses at all , except on the Isle of Staten, where it has favored some GOPers. Just an aside. The New Party didn’t disappear because it was getting no traction (it was, a bit) but because the Supreme Court ruled states could constitutionally deny parties the Fusion opportunity. So just eight states allow it now. (seven then.) There are many reasons why the New Party failed, but the High Court decision was the nail in the coffin for any effort by Rogers et al to build a national party, good or bad. Me too. Here in California we no longer have the option of voting Green in the general election as only the top two from the primaries advance to the November ballot. This is a new thing here. So in some races the voters chose between two Democrats which insures the progressive lose out to the more conservative. Three years ago when the “top-two” appeared as a ballot initiative there was a bevy of er, ‘progressive’ supporters like Marc Cooper promoting this as some sort of reform instead of snuffing out what little democracy is left. The result being that the Green Party asked its members to not vote for top-two candidates running for statewide offices. I only voted on ballot questions. I say all of this with the thought that along with looming ‘entitlement reform’ , growing militarism at home and abroad, that the same template of ‘electoral reform’ will gain traction as all those pesky names on that confusing NY ballot gets winnowed down to the ‘top-two’. Drive-time programs on KPFK (Pacifica) exhorted the listener to go vote and maybe some did. So what.